Responsible tourism is a new exciting drive force behind how travellers are choosing to experience their holidays. Gone are the days where you you hang out in typical touristy hotspots, where you never get to experience how the locals truly live. Hello to being a responsible traveller where you get to learn about new ways of life, new ways of making a living and more authenticity behind the stories that make up the country that you are visiting! 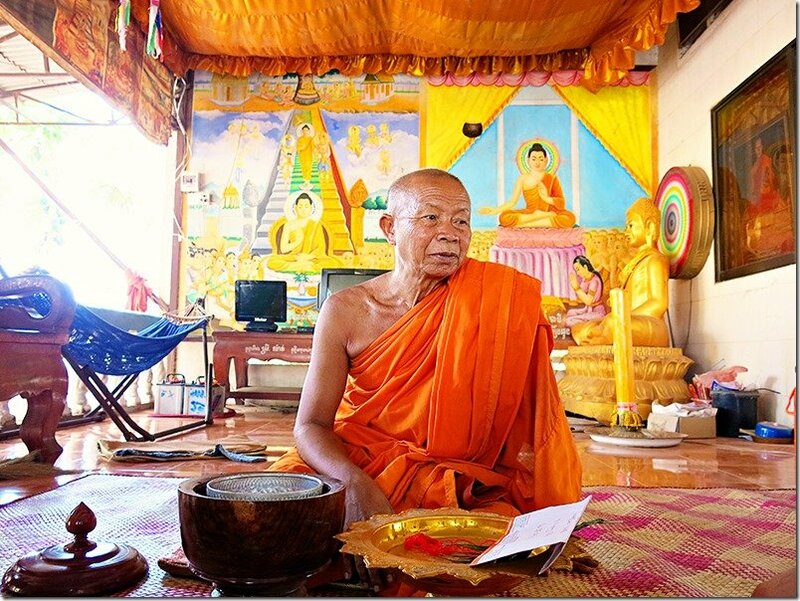 The Best Siem Reap Tour to See Kampong Khleang, Locals & Receive a Monk Blessing! 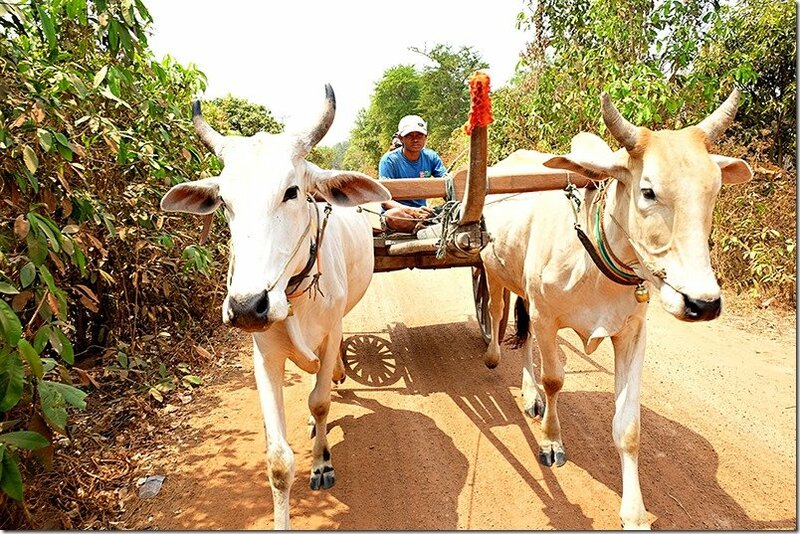 What you have seen thus far in Siem Reap …. it is all fake! He explained that it is all simply for the sake of the tourism industry. The locals have created a little bubble where tourists, who never venture further than the Angkor Temples and the touristy parts of Siem Reap, will be comfortable. Fancy resorts, fancy restaurants, massages at cheap prices and bars for those who want to party. 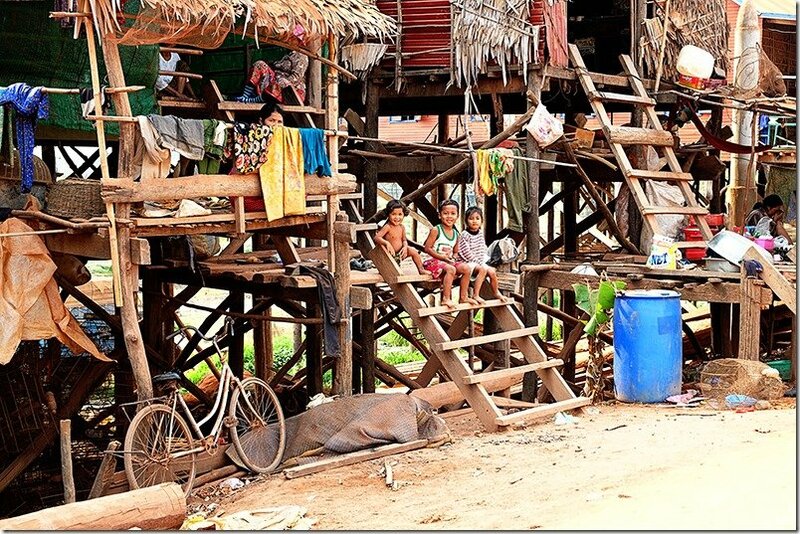 But it is not how the real Cambodians live! We were excited though, as we head out on a full day Siem Reap local tour to get some insight into what Siem Reap local life was like … in the ‘real’ Cambodia! What community life consists of and getting some hands-on experience as to what their typical day labour wise consists of! Not only that, but we were thrilled to know that this tour we were taking, was a tour that gave back to the community! 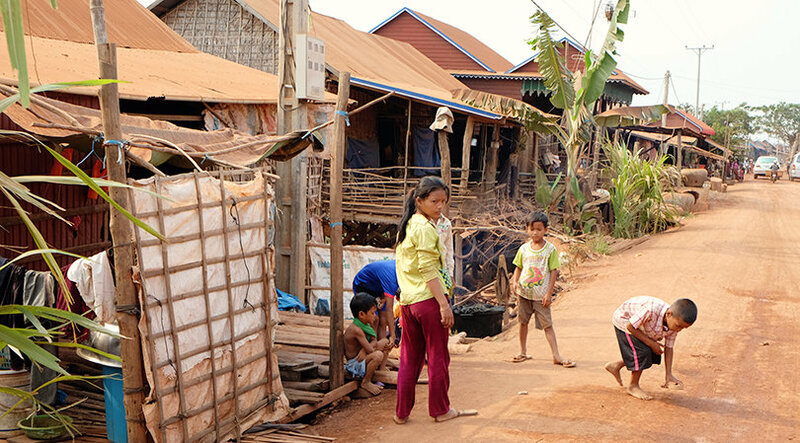 Funds from this Siem Reap day tour goes directly to the community to improve the lives of the people. How incredible is that!! That is what responsible travel is all about! And we were thankful to have found this incredible tour that Buffalo Tours so selflessly offers! And what a sensational and education day it turned out to be!! 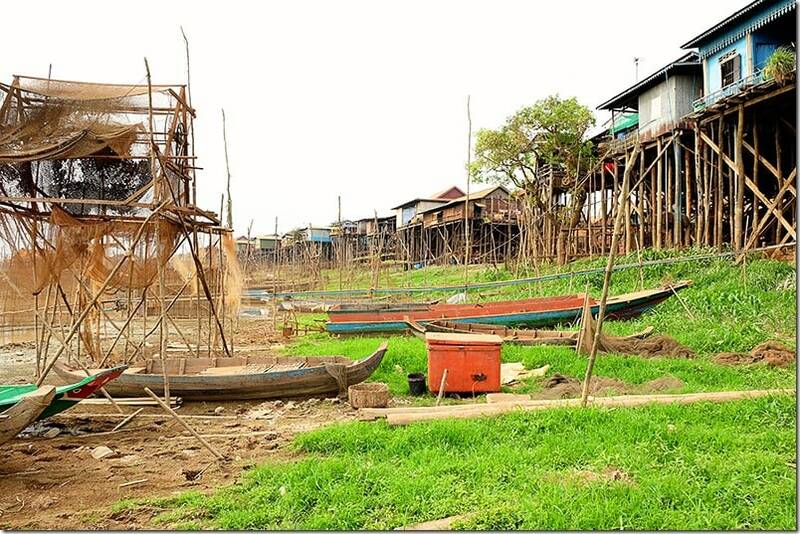 Our first stop for the day was to visit one of the local villages along the edge of Tonle Sap Lake. 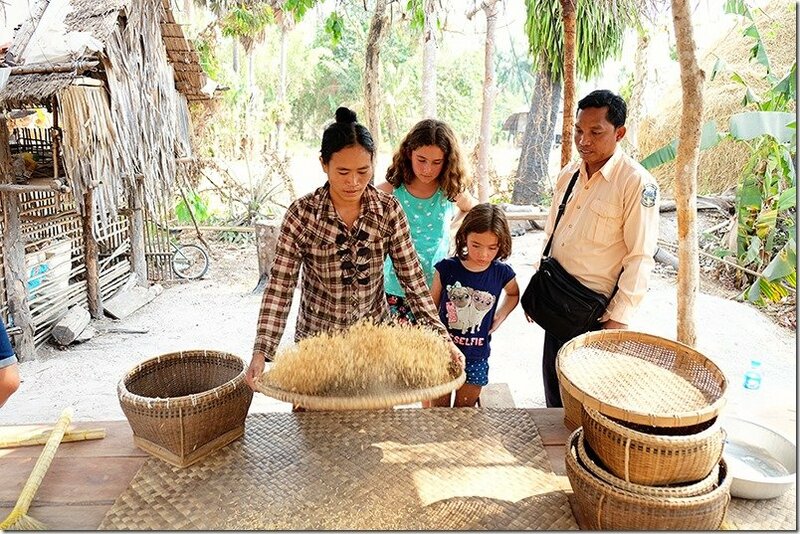 As we were visiting during the dry season, our tour guide decided to take us to one of the least visited of the three communities; around 55km from Siem Reap. All throughout our drive there, our guide was handing out insight into what life in Cambodia is really truly about. Our kids were listening so intently and had what seemed like over a hundred questions for him to answer. That is what family travel is about! Kids getting to learn about different ways of life, about hearing stories of how different life can be elsewhere! 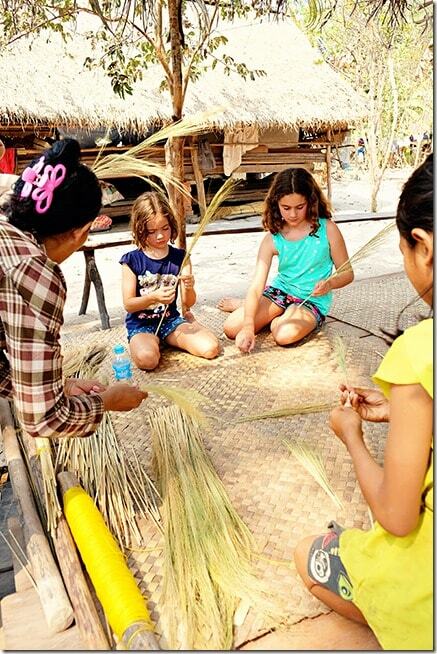 And how different life for kids are in Cambodia compared to Australia! That is what quality world education is about! 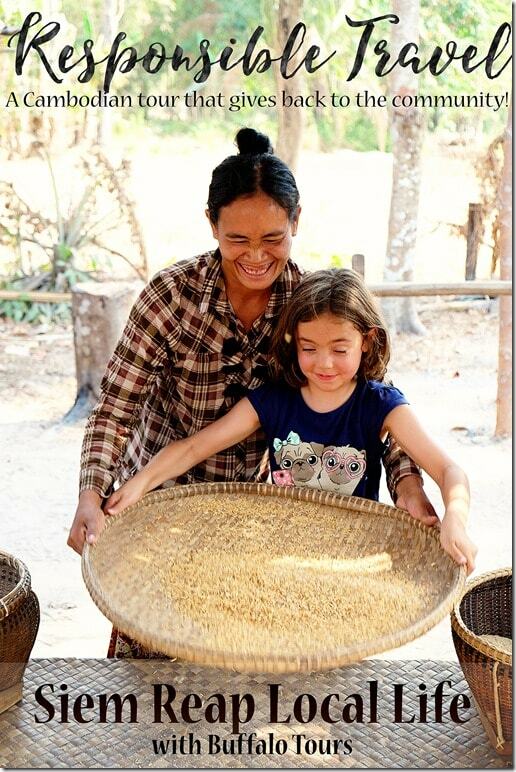 Kampong Khleang is an incredible village to visit! It is truly the most unique village I have ever had the experience of visiting! 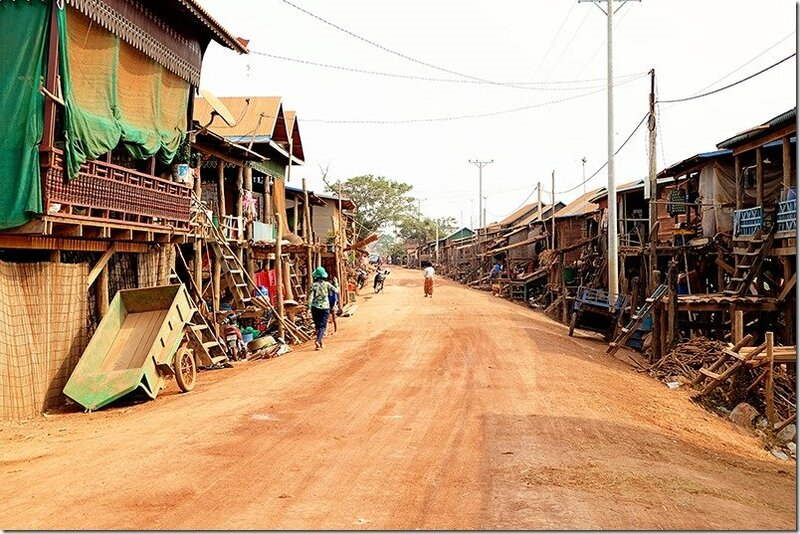 With the dry season, we could drive on the narrow red dusty road, flanked on both sides by wooden stilted homes. Next to the homes, a buzz of local activity being carried about, rice laid out to dry (narrowly being missed by the few vehicles passing by), newly caught fish being smoked, kids playing around. The whole van went quiet, as all we could do was observe a sight so different to our normal. At one stage we couldn’t resist anymore and asked our guide to stop so we can get out and walk on the road instead. There, we could get amongst it even more, friendly kids waving to us and screaming in delight as the ‘tourists’ pass by their homes. Insight into what life inside these basic homes were like. Pictures of gazillion fishing baskets hanging from the home, waiting for the wet season to arrive! Here you will not find any fancy buildings, no posh furniture inside. Life here is basic. Life here is hard. But yet the people are friendly and smiling. They have all they need in life and as a community they work together, live together and look out for each other. Something that seems amiss, these days, in a lot of Western society countries. 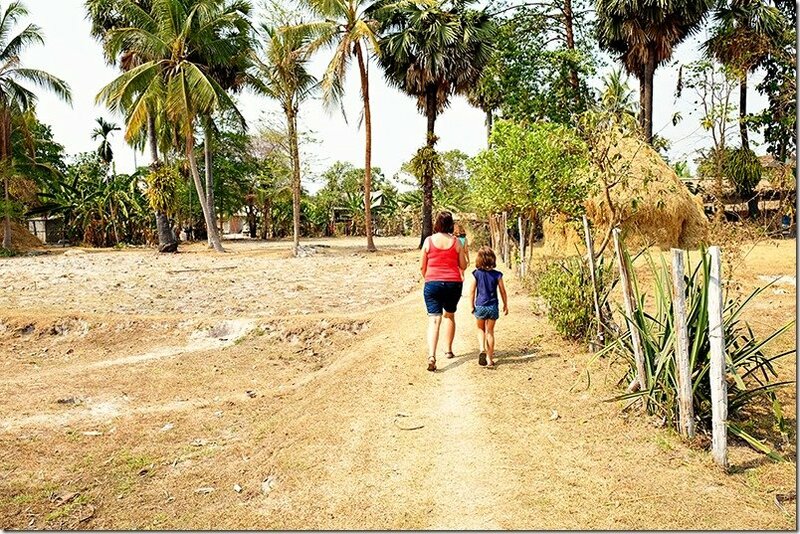 We also had a walk down to the river, currently pretty dry with only shallow water around, it was hard to imagine this village in the rainy season being flooded and accessible only by water. 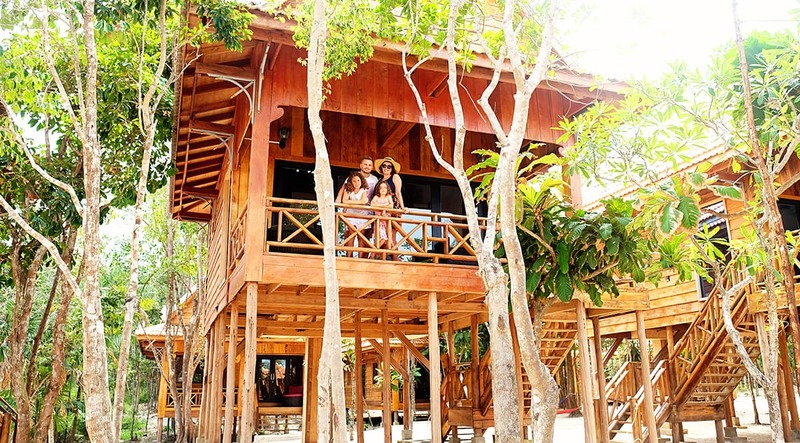 Stilts to these homes can climb up to 10 metres in the air. What an truly incredible sight to see! Can you imagine raising a crawling baby in one of these houses? After getting back into the van, we carried on to our destination. At the end of the road, we were met by a selection of boatmen. A cruise on the Tonle Sap waters is what we actually came here for. To witness life in the lake itself. The community of people who live here make their living from farmed fishing; it was fascinating getting some insight into how they also go about growing their vegetables and how they manage their livestock as well. You can see with the kids playing in the photo below how shallow the river has become this dry season, currently muddy and too warm, you won’t really find any fish around. 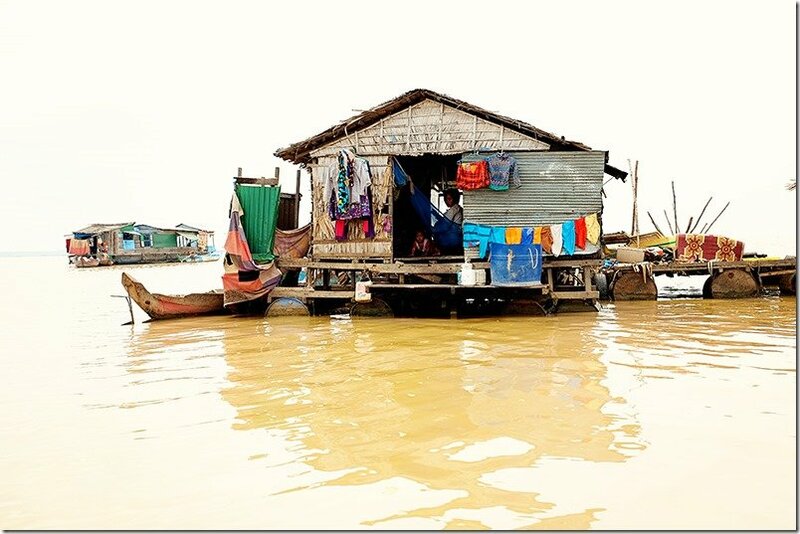 We followed the water all the way out to the location of a true authentic floating village. Fascinated with how people raise kids from such a young age with nothing but water surrounding them. Some satellite dishes poking out of the roofs of some homes; a deserted floating school for the children close by. Unlike other tours of floating villages which felt pretty touristy, our boat never went intrusively close to the people’s homes, giving us insight from a distance, whilst still respecting the privacy of the locals as well. What a truly fascinating look into the lives of real Cambodians! An experience I will never forget! An education that will also stay true in my mind! But yet as the afternoon approaches, it was time to set off for the next destination of the day. 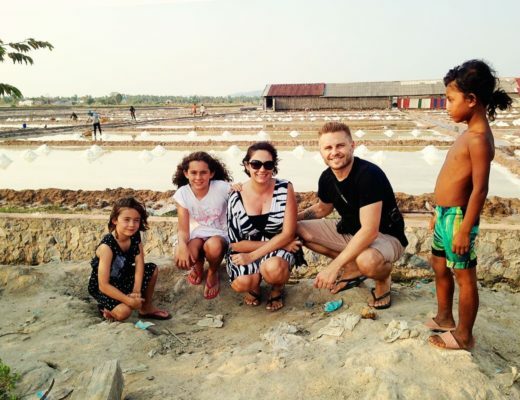 With some insight into how a village based on fishing agriculture worked, we were bound to visit a small little village that was all about farming and animal husbandry. After about an hour’s drive on some pretty bumpy dusty dirt roads, we reached a small village called Chansar. We were most definitely the only tourists here and the locals truly delighted in seeing us around their homes and streets. 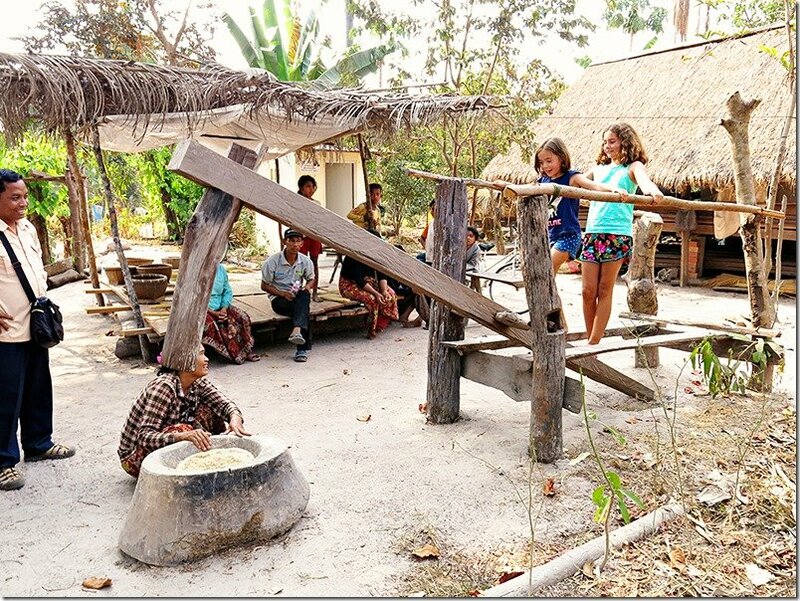 In this village we got to experience a range of activities, most of which were hands-on whilst others consisted of chatting to the locals through our translator aka our tour guide! 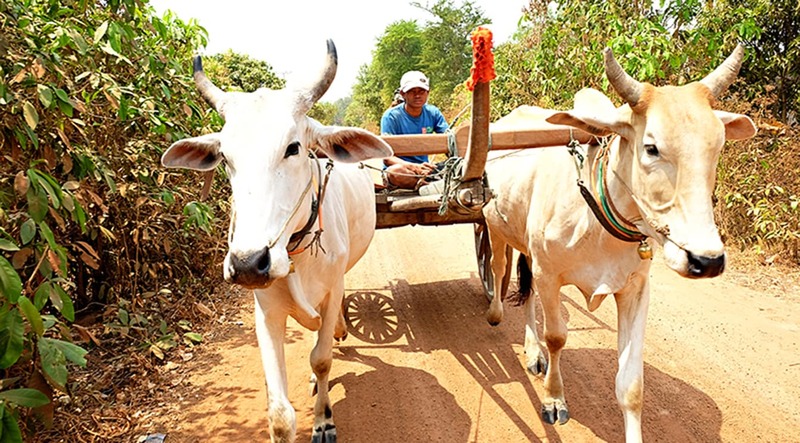 Our first activity for the afternoon was experiencing a local ox cart ride. A pretty bumpy ride as we made our way down the dirt road heading towards our destination for our lunch of the day. The kids had an absolute ball on the ride! I must admit that we probably looked like true tourists as we had a supply of umbrellas to hide underneath as the heat in the afternoon was pretty extreme. It’s not every day that you get to ride on an ox cart to lunch haha, it was a great experience. A tour around the grounds of the village gave us an opportunity to meet and greet with the locals, and to also get up close to their homes and their lifestyle. Here a local broom maker is hanging out below her house, going through the process of making broom after broom. Thanks to our guide, we were able to ask some questions and find out more about the time, costs and process involved in making a living from broom making! We learnt that all the hard work only equates to 35c per broom, but on a good day they can sell up to 300 brooms. They have to load all these brooms on to their scooters, to travel all the way to a market in Siem Reap where they can go about trying to sell them. The daughter was the seller, whilst the mother stayed at home making more brooms. After a bit of a chat, we thought it best to leave them to get back to their hard work and headed into their backyard to get some insight into what else they have to do in order to survive. 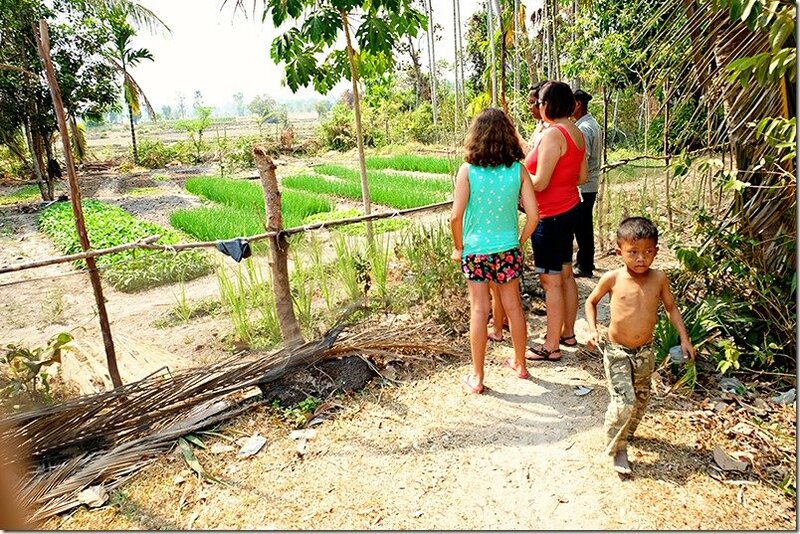 Here you will find their own little vegetable farming patch, complete with all the yummy and delicious veggies and herbs that are typical in Cambodia. It is important to remember that Cambodians mostly survive on what they can produce themselves, these veggies will most likely not get sold, but just used to sustain their own families. 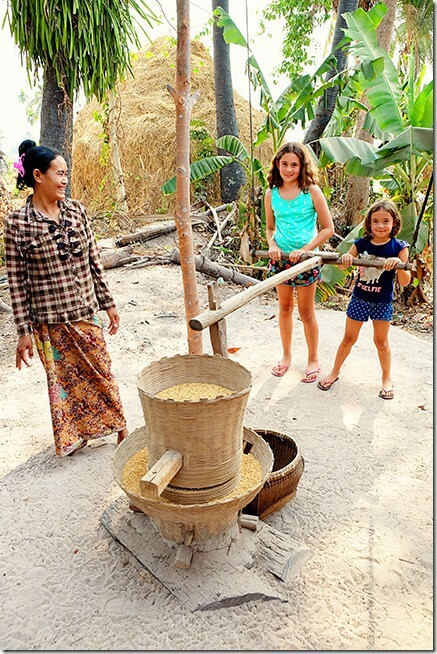 Following along the food path, you can see how dry the land in Cambodia currently is. Of course the dry patches of earth to our left, would be beautiful lush green rice paddies comes the rainy season. A country so extreme in weather patterns, it is incredible! To the right you can see the haystack, most houses have one of these ready for the wet season, so they can feed their livestock when most of their land is covered by water in the rainy season. Lots of hard work huh! After learning more about how the locals collect water, and how they sleep and how they live, we made a turn into another communal area. 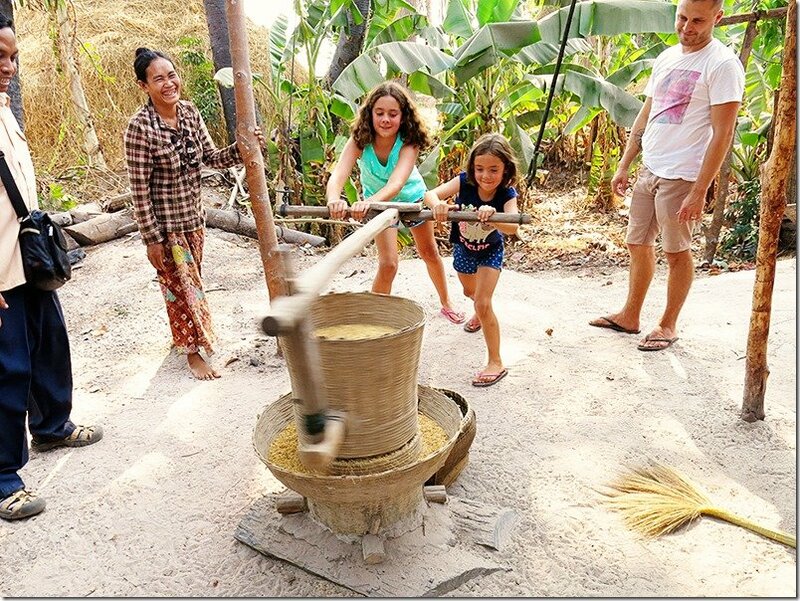 Here we were going to get some lessons into broom making as well as the rice processing process. I can honestly say that it was a true delight watching our daughters here, eager to learn, eager to try and eager with questions on hand. As the locals don’t see tourists very often, we also weren’t always too sure if we were there to watch and learn more about them, or if it was the other way around! The seating area quickly filled up with locals and kids who were eagerly watching us fumble about with their ways, laughing and giggling! If anything, it was such a fun afternoon, no barriers between locals and tourists here, but simply felt like friends hanging out together. 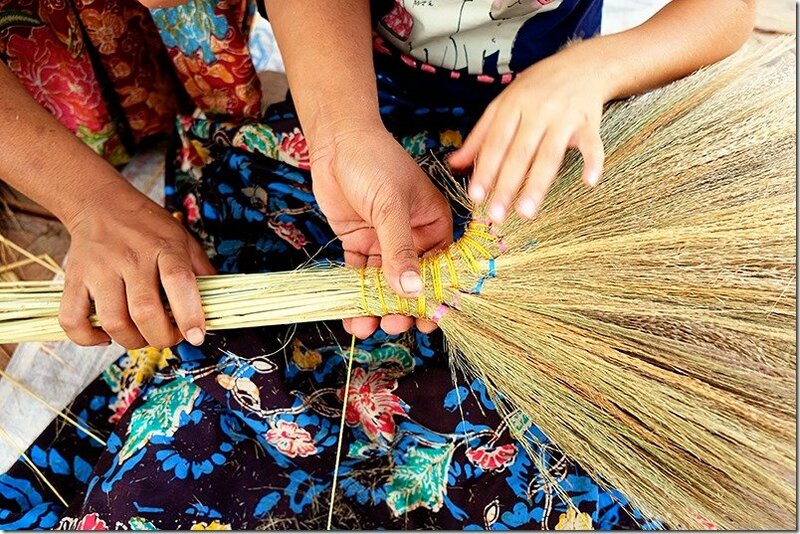 First step in broom production is to make little bundles, after which you go through a process of bundling these bundles up and tying them up very tight with some string. It was hard work and these ladies have some pretty strong hands that comes from doing this all day long! 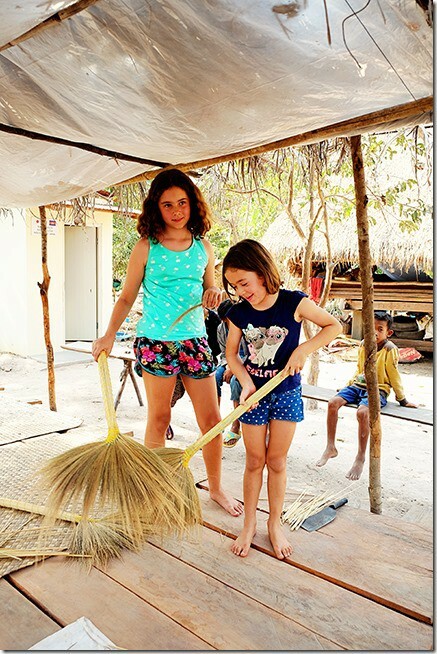 After some pretty hard work, the girls were proud of the brooms they made and had to give them a test run to see if they really could sweep as well as they looked! Next activity and we moved onto the rice. Of course the rice had already been harvested and been laid out to dry. 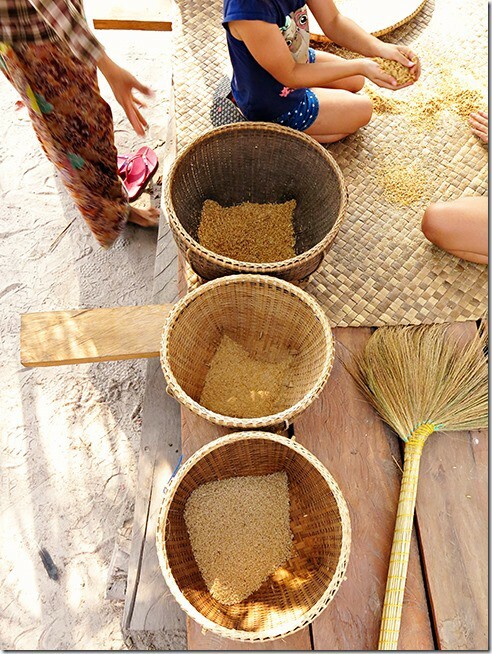 So our job of the day was to open the seed of the rice and to separate the components into three baskets. A time consuming process! Lots of hard work, loads of manual labour and different stages to get the rice from the complete coated seed to the final product. Now we have three baskets from the various parts of the rice seed. The rice which is of course kept for eating purposes, another baskets which will used to feed the chickens and pigs and the last, which is the outer seed covering, which can’t be eaten. That contents of last basket is burnt and then used as fertilizer! As I’ve said before, everything has a purpose in Cambodia and nothing gets wasted! 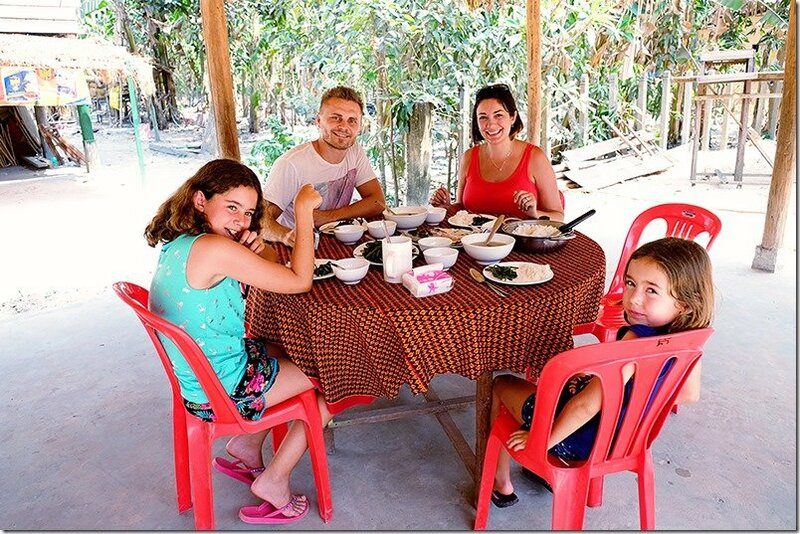 As part of the full day tour, you will also get to enjoy a simple typical Khmer lunch. 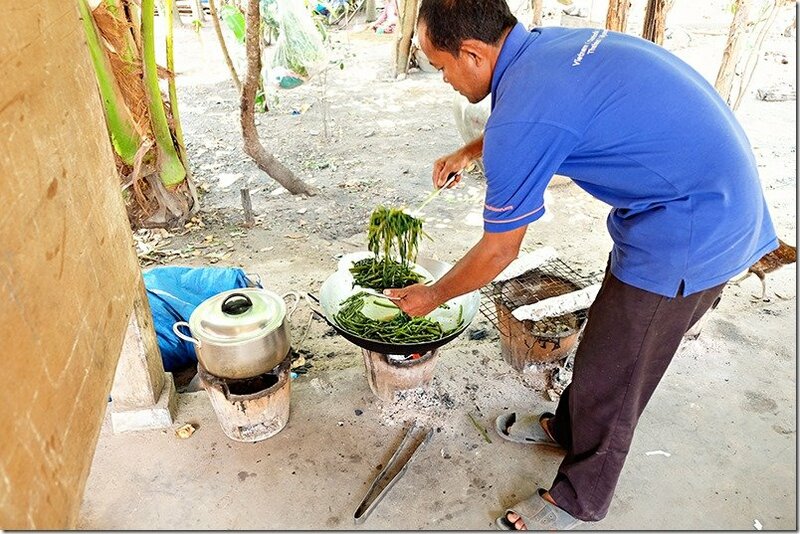 Here you can see our host cook, cooking some morning glory for us on a typical Cambodian outdoor kitchen. Very interesting to watch them cook, lucky they were really friendly and did not mind us intruding to take some photos of our lunch in the making! 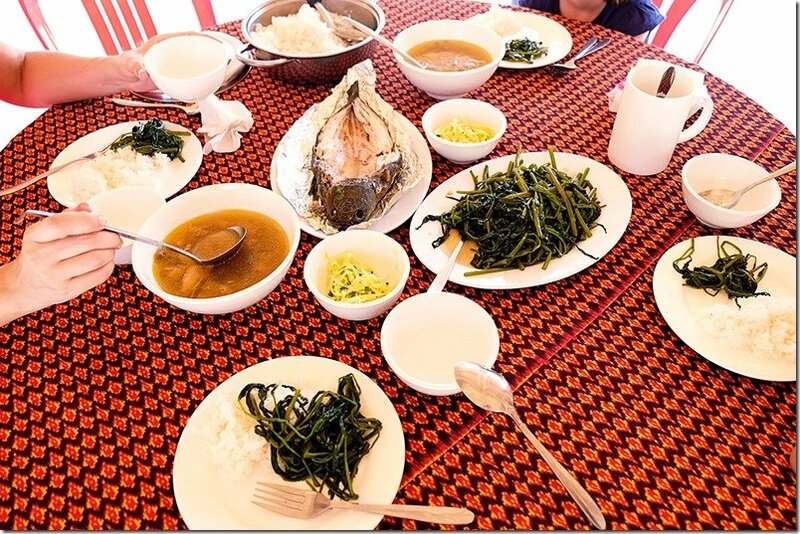 Our yummy lunch consisted of some local grown morning glory, some freshly caught snakehead fish, some rice, a pickled mango salad and some delicious soup. Yumm! The last activity for the day was a stop at a local Buddhist temple where we received a blessing from a monk. We were also privileged in being able to ask questions which our guide translated for us. We didn’t know much about the Buddhist way of life, so it was great to get some insight into what life for them is like. The monk himself was also curious about life in Australia and asked a few questions himself to broaden his own knowledge. What a truly special way to finish the tour for the day! We enjoyed a truly spectacular day with Buffalo Tours. Fair enough to say we were absolutely exhausted and buggered after the full day of adventure, but grateful for the experiences that could broaden our understanding of the Cambodian way of life! I love that my kids could learn so much and experience so many hands-on activities! A day that I'm sure they will take with them as they grow and develop through the years! And a great start and introduction to them of how they can be responsible travellers throughout life! Duration of Tour: This tour is a full day tour. They will pick you up from your hotel at 8am and return at around 4pm. Inclusions: This tour includes all transport costs together with all the various activities that you will enjoy on the day. Lunch is also included and so is free pickup and drop-off at your Siem Reap hotel. Benefits of this Tour: A great way to be a responsible traveller. Funds from this tour go directly to improving the lives of the communities you visited on the day! Contact: You can contact Buffalo Tours on [email protected] for more information. For the purpose of reviewing Buffalo Tours, we received a complimentary tour. As always, all thoughts and opinions are my own. This looks amazing. Seems very similar to Thai culture and local life. I’ve done the rice thing at Sampran riverside resort near Bangkok (supposedly an eco-cultural destination, minus the fact they use elephants for shows). I’m saving this for later when I visit Siam Reap. Awesome! Yes similarities across South-East Asian countries for sure!! We saw Vietnam late last year and there are some key similarities too! Have an awesome trip to Siem Reap! Hi Jolene! Nice post! You know I thrill whenever I see the culture of South East Asia. It’s because almost most of them are same as you already mentioned. I am from Assam, India, and for your surprise(only if have not visited Assam yet), all activities are still same here in the village areas of Assam as you have witnessed there, except, our food preparation is bit different from them because we are far from coastal line. Even we make broom with the same grasses, but tie them in a bunch. Happy traveling! Thanks for posting this Jolene. We are a family of three, with a four year old boy. We have traveled extensively with him, but for some reason every time we say something to people about going to Cambodia, they tell us we’re nuts. I should just trust my instincts when it comes to traveling with our son! We’re hoping to visit Siam Reap in May, when on the way to Vietnam where my husband has a conference. 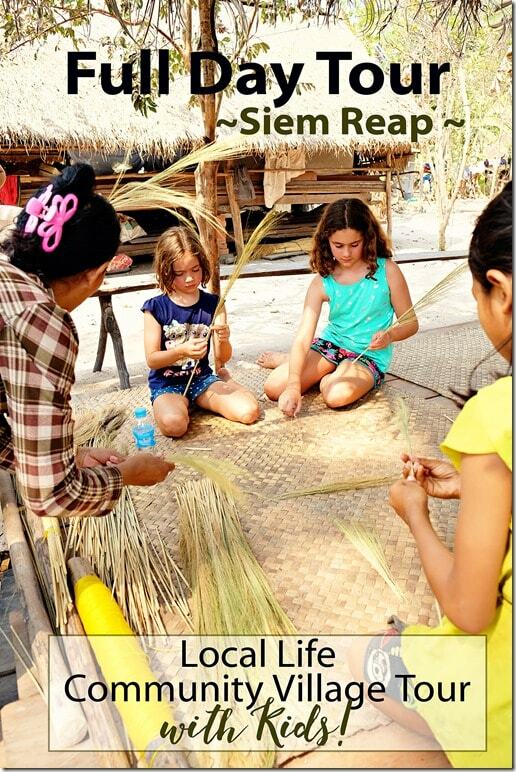 How old were your girls when you took them to Siam Reap? Thanks again! Jolene….how much did this day trip cost?? 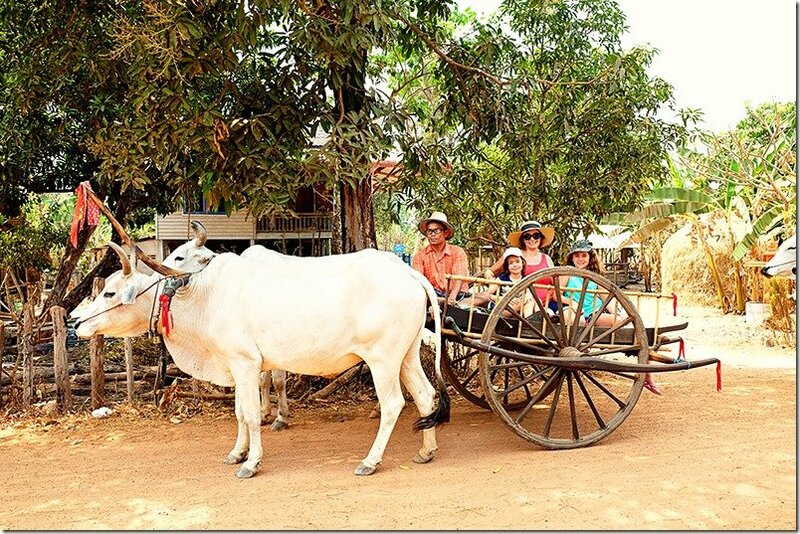 Hi, what month did u visit Siem Reap and do the buffalo tour? U stated that due to dry season, they took from siem reap to the floating village by shuttle van? Some pictures show that there were some kids on the boat, i wonder if the kids were in the same village u visited or they were in a different further village? Thanks, sorry to ask questions , just a little confused here. HAPPY HOLIDAYS TO ALL OF YOU and congrats on your third child. Hi Sebastian, we were there early March. A large part of the village was dry and therefore we had the van drive us until the river. 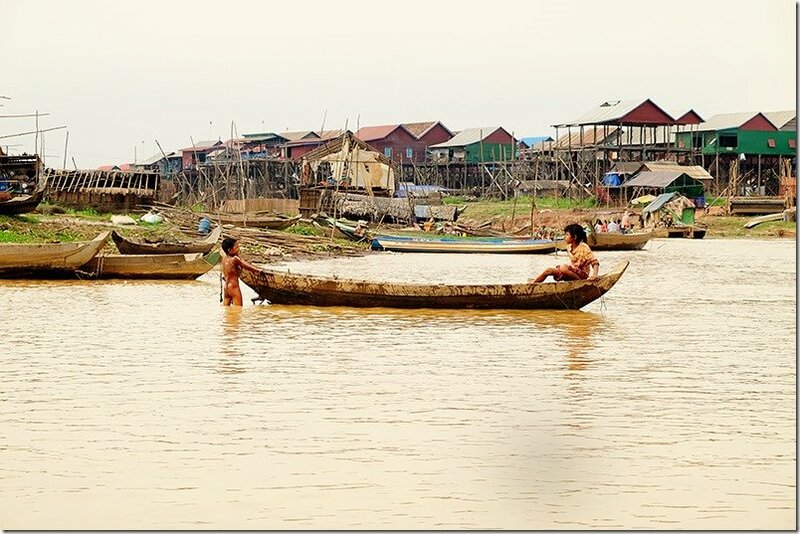 The kids were in the same village but there was a bit of the river left, but as you can see the water was really shallow – but enough for us to go for a boat ride out to Tonle Sap Lake so we could see the floating village. I heading to Siem Reap tomorrow, and apart from Angkor Wat and floating village, I don’t know much more on what I can do. I just told the Tuk-Tuk driver that my cousin referred me to that I let him decide what is best… At the same time, I don’t just want to do touristy stuff. Angkor Wat is the exception because it is a must-see no matter what. However, I want to see the real life as well, and respect the local people. Anyway, I’m glad you were able to do that! And I hope I can do something similar as well!! Have a great trip!! If you want to see the non-touristy floating village make sure to ask for a trip to Kampong Khleang as the other floating village that is closer to Siem Reap is super touristy! Siem Reap itself is a really touristy place really, so unless you are prepared to travel away from it a bit, it will be hard to find authentic experiences. Have a brilliant trip!! Ahhh so disappointed. This looked so good we arranged extra time in Siem Reap to do this tour. I should have checked the price first- US$368! Absolutely crazy. Hi Sharon, was that the quote for all 5 of you guys? Sorry, it is too pricey for you guys because it was honestly a fabulous day – a very long one, but so memorable. I really appreciated this tour style. It is about local contact and responsible travel. Keep continued! It is a very interesting way to discover local life & culture.